Drama about a group of midwives in 1960s London. The team must rally to prepare for Sister Monica Joan’s birthday. Meanwhile, the closing of a nearby maternity home brings an influx of expectant mothers to the Nonnatus midwives. There is a Japanese flavour to this week’s show, as Matt LeBlanc and Chris Harris buy second-hand sports cars at auction for a big road trip across Honshu, while Rory has one night to discover the weirdest car culture Tokyo has to offer. Out on track, Chris compares the Honda Civic Type R and Lexus LC500. Documentary series. Alan Titchmarsh reveals the history, human stories and the hidden treasures of Britain’s historical estates. Alan explores a French Renaissance-style chateau in the heart of the Buckinghamshire countryside which was a magnet for the great and the good of the 19th century. Clive Aslet visits Flint House, a striking example of modern architecture, on the same estate. Oz Clarke watches the restoration of a precious Dubois lacquer desk, and Alison Hammond visits Polesden Lacey. 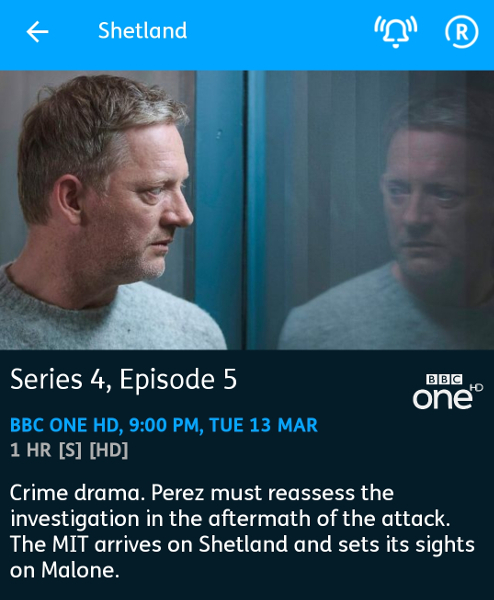 Crime drama set on the remote Scottish islands. Perez must reassess the investigation in the aftermath of the attack. The MIT arrives on Shetland and sets its sights on Malone. Meanwhile, Tosh begins to have doubts about Lars. Wildlife series revealing the hidden lives of both the familiar and more unusual animals with which we share our island home. Britain’s forests contain majestic trees, some of them thousands of years old. Behind the leafy veil, there are booming populations of previously rare wild boar and goshawks. Documentary in which actor David Hayman presents a personal view of the battle for access to Scotland’s countryside, revealing how this conflict has shaped the physical and cultural landscape of the country. He meets landowners, gamekeepers and hill walkers to discover how ordinary Scots have come to claim their right to roam over their country’s mountains and glens, starting with Victorian rebels who dared to march across private grouse moors and progressing on to the 1930s, when thousands of urban Scots streamed out of the cities and into the hills. Finally, he discovers the present-day controversies that may threaten Scotland’s internationally renowned and hard-fought right to roam laws. Comedy series in which lifelong friends cope with everything modern life has to throw at them. Boabby is persuaded to have a lock-in at The Clansman to mark the passing of Craiglang’s much-respected undertaker, so the regulars enjoy outdoing each other with stories of the most famous person they have ever met, dead or alive. After news spreads that a creepy new undertaker, Sheathing, has moved into Craiglang, nobody quite knows what to make of him. Isa, who has heard the stories, spreads the fear amongst the residents that he’s the grim reaper. Jack decides to figure out who this mysterious new undertaker really is. But when Isa turns up at Victor’s door in a complete panic and Sheathing appears unannounced, Jack and Victor have no option but to take matters into their own hands. Documentary series going behind the scenes of the North Yorkshire Moors Railway on its 50th anniversary. The busy summer season is looming and the steam engines are old, so there’s always something to fix. The only chance of getting through the summer is if they complete the overhaul of Repton, a 1934 Schools class engine.